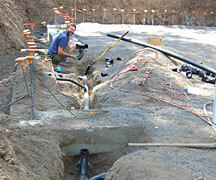 Aug 30, 2007 - installed manifold for the domestic water. 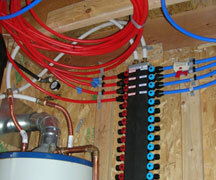 Red is hot, blue is cold. White is supply. 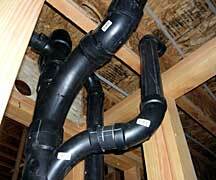 July 29, 2007 - Most of the plumbing is done. 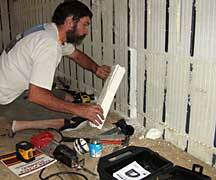 Gary cuts the styrofoam out with the reciprocating saw, and replaces it with the drain pipe. 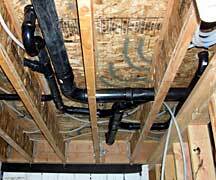 May 27, 2007 - The beginning of the plumbing on the house. 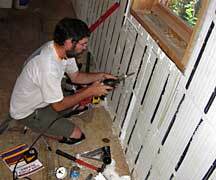 Gary is working on the basement bathroom drains. 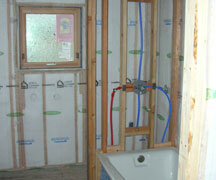 Mar 1 , 2007 - Plumbing completed. 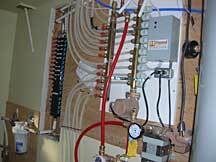 PEX tubing can be run directly from a distribution point continuously to the desired outlet fixture without cutting or splicing; this reduces the need for potentially weak and costly joints. 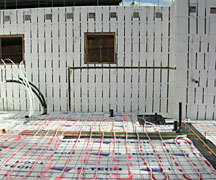 The cost of material can also be approximately 20% less than alternatives, and installation is much less labor intensive. 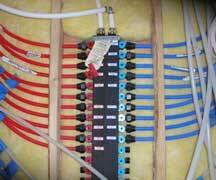 Red is hot, blue is cold. Purchased from Radiant Direct.